When Pope Francis celebrated mass at Madison Square Garden in September, he reminded New Yorkers that God dwells in their city, no matter how much “smog” it may have. Cities can be dirty places, both literally and spiritually, but this fact does not keep away God’s infinite love. 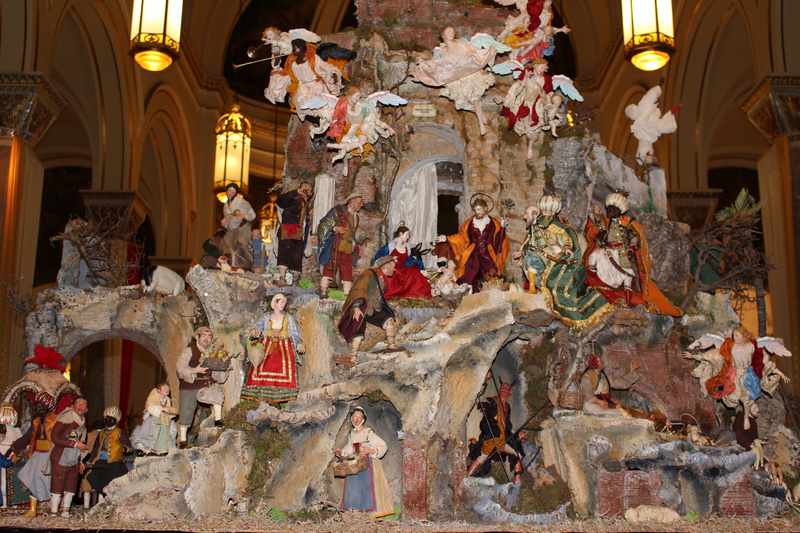 Building upon Pope Francis’ proclamation of the Extraordinary Jubilee Year of Mercy, the Shrine Church of the Most Precious Blood in New York City has displayed a nativity scene like no other. On Monday, I went to see it and spent almost an hour admiring its many artistic and theological details. 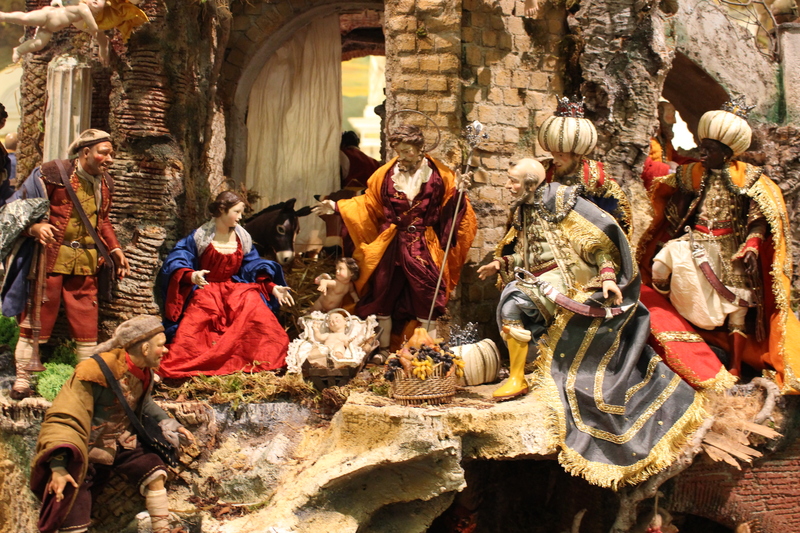 The Nativity of Mercy is a creation of the Scuotto brothers whose workshop specializes in making colorful and dramatic creches (or presepi as they are known in Italian). 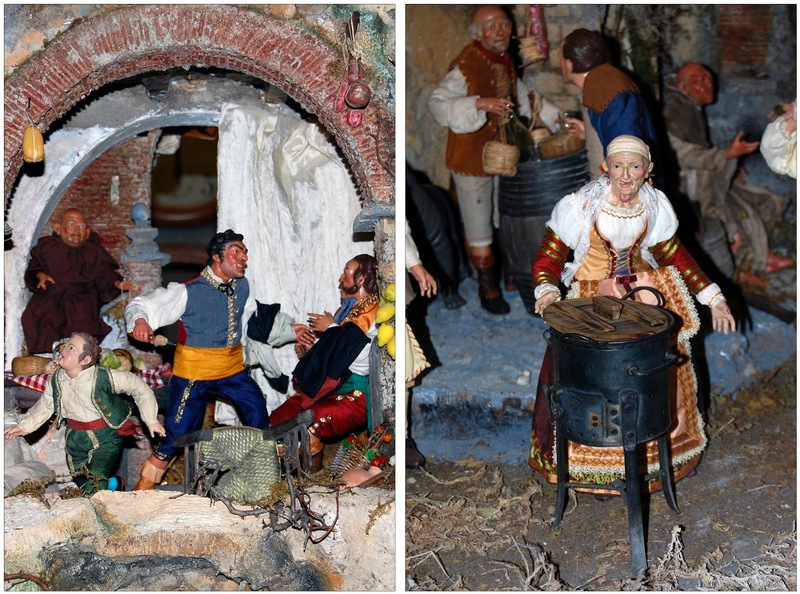 This particular presepio draws from Rembrandt’s Return of the Prodigal Son, Caravaggio’s Seven Works of Mercy, and the Neapolitan presepio tradition. Rembrandt’s Return of the Prodigal Son, is the most famous artistic rendering of that great parable of mercy. With the timeless fable and with his entire life, Christ communicated the lavish and overwhelming mercy of God the Father. 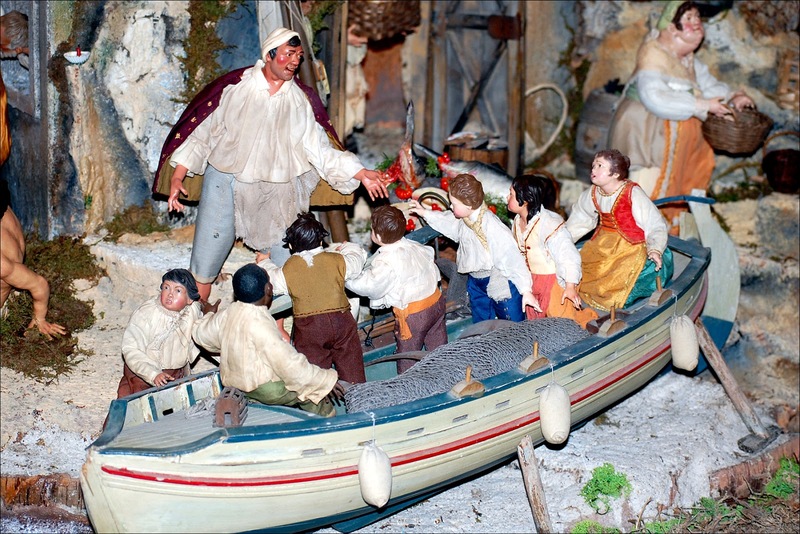 The presence of figurines inspired by Rembrandt’s masterpiece reminds us that Christ’s becoming man is the Heavenly Father’s embrace of all of destitute humanity. 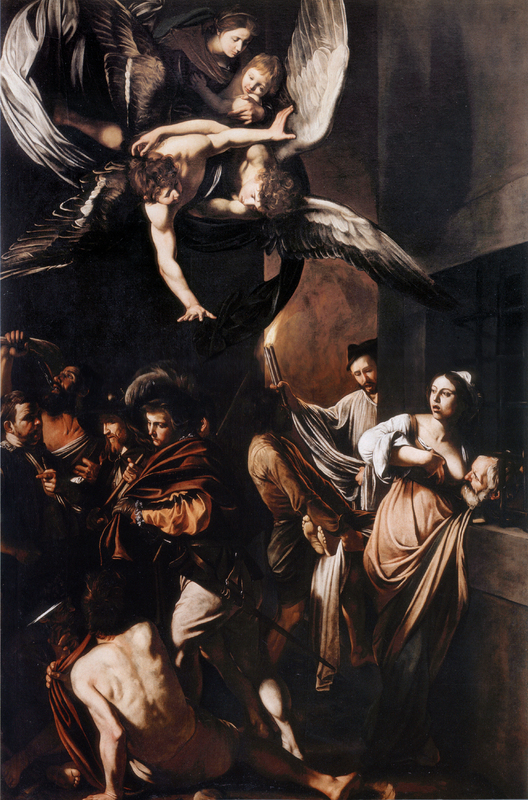 The sculptors of the The Nativity of Mercy had the advantage of studying Caravaggio’s Seven Works of Mercy in-person. Located in the Neapolitan church of Pio Monte della Misericordia, it is a product of one of the artist’s sojourns in the Italian port city. It depicts all of the corporal works of mercy: feeding the hungry, giving drink to the thirsty, clothing the naked, sheltering the homeless, caring for the sick, visiting the imprisoned, and burying the dead. The brothers Scuotto draw heavily from the Caravaggio, while adding details of their own. The beauty of Neapolitan presepi is that they colorfully show the drama of the Incarnation and the paradox of the coming to Earth of the Second Person of the Holy Trinity. Instead of an isolated and peaceful stable, the Christ Child is inserted into the midst of a bustling urban scene full of human life, activity, and even depravity. 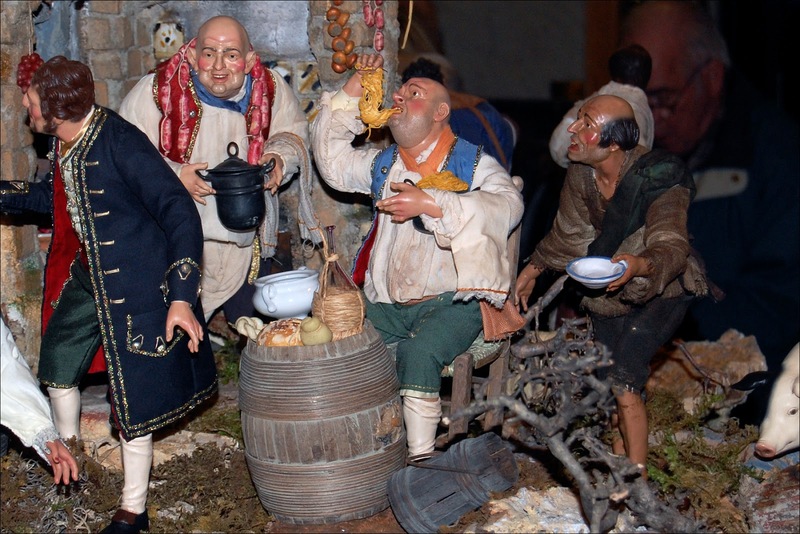 The Nativity of Mercy shows gritty scenes of sin: hot-blooded bravos fight in a tavern, a drunkard lolls in inebriation, and a glutton gorges himself with pasta while ignoring a famished beggar. When Our Lord came to Earth, he did not remain in a bubble of heavenly purity. Rather, he fully entered our reality in all of its banality and profanity. From the moment of his birth in a smelly stable to his death on a cross, Christ did not shrink from the full human experience. Even though he was sinless himself, he lived in the midst of sinful humanity and was affected by it. The Nativity of Mercy wonderfully communicates this truly awesome reality of the Incarnation that remains just as beautiful and astounding two millennia later: despite man’s sinfulness, Heaven has stooped to Earth, the sacred has intermingled with the profane, and God is now man. The Nativity of Mercy is a powerful reminder for all of us that God is not afraid of our “smog”: on the contrary, he eagerly enters into it in order to be closer to his beloved children. Click here for more information on The Nativity of Mercy. For those in New York, I highly suggest going to see it at the Shrine Church of the Most Precious Blood on Baxter Street near Canal Street. It is well worth the visit!